After killing Shannon, Ana Lucia acts in her normal, rational manner, and knocks Sayid out and ties him up to a tree, essentially keeping him hostage while she figures out what she's supposed to know now that her first act upon reaching the other survivors' camp is to kill one of them. Eko's not having any of this and takes Sawyer to their camp to get some medical attention. Michael lets Sayid know what happened to them and the raft. Jack and Kate engage in a game of golf, but as Jack lines up his shot, Eko comes out of the jungle with Sawyer over his back. Ana Lucia sends Michael back to the camp with a list of supplies to get her, as she plans on staying out there by herself and needs things to survive. Jack tries to work on Sawyer while Locke assesses the situation with Eko. Bernard leaves the group to head to camp and find his wife, and Libby goes with. Michael comes running through the jungle and runs into Sun, and tells him that everyone's okay. Jack has stabilized Sawyer, so he turns into irrational angry Jack and tries to get answers from Eko. Michael comes into the hatch, and Jack decides to take some guns and confront Ana Lucia. Eko stops them, and upon mentioning Ana Lucia's name, Jack realizes he knows who she is. Eko agrees to take Jack out there, without any guns. Ana Lucia lets Sayid go, and he takes Shannon's body back to camp. 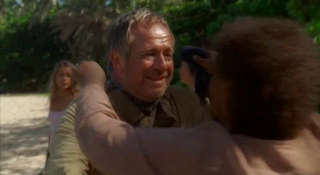 Jin returns to the beach with Libby and Bernard, and we get a happy LOST reunion scene. In other news, Paolo is trying to find a place to hide the diamonds that he found in the lake but didn't tell Nikki about, and while wandering in the jungle, he finds the Pearl station, and decides to hide the diamonds in the back of the toilet. While he's in there, Ben and Juliet come down to check out the Swan's cameras, and talk about Ben's plans to get Jack to perform surgery on his back. A funeral is held for Shannon, and meanwhile in the hatch Kate's freaking out because she's seeing things that remind her of her past. Locke shows the orientation film to Michael and Eko. Eko then gives Locke a Bible, and inside of it, the missing filmstrips from the film. The episode runs 56:14 and is 456MB to download. You can stream below (via Facebook), or go here to use torrents (better quality, recommended) to download the episodes to your computer.